Madagascar's master shipbuilders can all trace their skills back to just one family who arrived on the African island more than 150 years ago, writes Tim Healy in the capital, Antananarivo. In the 19th Century, schooners were a familiar sight along France's northern coast, their majestic sails fluttering in the wind. Nowadays, they have been replaced by boats which are far faster, more efficient - and less romantic. 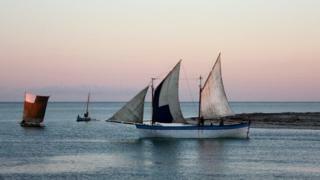 The mastery shown by carpenters working in the town of Belo-sur-mer on Madagascar's west coast is respected around the world - at least one of their beautifully crafted schooners has been sent to collectors in France in recent years. And it is all thanks to one family, brought to the island by a king's ambition. But the Vezo Sakalava - coastal people from the western region - wanted to develop bigger trading boats to move cargo around the island, and King Radama was happy to grant their wish. Soon, the Joachim family, who were creoles of mixed European and African descent, and fellow marine carpenters from France's neighbouring island of La Reunion were sailing to Madagascar. By 1904 - some 40 years after they first stepped foot on Madagascar - some of the Joachim family had managed to establish shipbuilding schools. It was done with the approval of France's Governor Gallieni, since the French had colonised Madagascar almost a decade earlier, in 1895. "My sons and I come from a long line of shipbuilders going back to my great-grandparents," says the patriarch, known simply as Mr Justin. The name of one of their boats, Fagnanarantsoandraza, translates from poetic Malagasy to "let it be known that the fine have no need to stay here". It is a name worthy of the love put into building the boat, constructed with timber painstakingly collected from nearby forests. Of the three Joachim sons, Albert's influence is perhaps most felt today. The Malagasy diminutive of Albert is Bebe, and the port in Morondava bears this name. He had married a woman 54km (34 miles) away in the village Belo-sur-mer, where he died in 1902. A century later in 2002, a French woman living locally was determined to locate Ludovic's grave and managed to do so with the help of the mayor, and village elders. Local authorities decided to restore the grave and mounted a miniature wooden schooner upon the tomb, to honour the Joachim family's unique contribution to the island's seafaring traditions.